Here is the 2016 New York Islanders Qualifying Tournament in its entirety. This series started off with a bang. A double overtime bang, to be in fact. The top-seeded ’81-’82 New York Islanders and the 2nd-seeded ’80-’81 New York Islanders were tied 5-5 after two periods and then each team scored twice in the third to end regulation tied at seven. It wasn’t until the 8:18 mark of the second overtime that Mike Bossy scored the winner for the ’80-’81 Islanders to give them an early lead in the series. The ’81-’82 Islanders responded with a big 10-4 win in game 2. Bossy and John Tonelli led the way in the win with six (3G, 3A) and seven (2G, 5A) points, respectively. In Game 3, the two teams combined for nine goals in the first period and then accounted for just four over the next two. Bryan Trottier scored early in the third to give the ’80-’81 Islanders a 6-5 lead. Then, just five and a half minutes later, Trottier scored for the ’81-’82 Islanders to tie it back up, one of four goals for the ’81-’82 Islanders’ Trottier on the day. Then, a Hector Marini PP goal with just under three minutes remaining gave the ’81-’82 Islanders a 7-6 lead and they would hold on for that to be the final. In Game 4, the ’80-’81 Islanders were trailing by one late in the third when they pulled goaltender Billy Smith for an extra attacker. Anders Kallur scored with just under a minute remaining to tie it for the ’80-’81 Islanders and then almost eight minutes into the resulting overtime, Kallur scored to complete his hat trick and tie the series at two. The momentum for the ’80-’81 Islanders carried over into Game 5 as they blew away the ’81-’82 Islanders 7-1. Seven different players for the ’80-’81 Islanders posted a multi-point effort, including Trottier, whose goal and two assists was a game-high. The ’81-’82 Islanders came back with their own blowout, an 8-2 win to force a Game 7. Both Bossy and Trottier posted six points as Bossy scored three times and added three assists while Trottier scored twice and added four assists. In Game 7, the ’81-’82 Islanders led 4-2 after two periods. The ’80-’81 Islanders scored a PP goal just seconds into the third to make it a one-goal game. However, Trottier slammed home a rebound seven minutes later to retake a two-goal lead. The ’80-’81 Islanders responded with two unanswered goals over the next seven minutes to tie the game at five. Just a minute later and with less than five minutes left, Trottier scored his third of the game for the ’81-’82 Islanders to take a 6-5 lead. They would hold onto that lead to clinch their second consecutive trip to the Ultimate NHL Playoff. Up next is the 2016 Pittsburgh Penguins Qualifying Tournament! 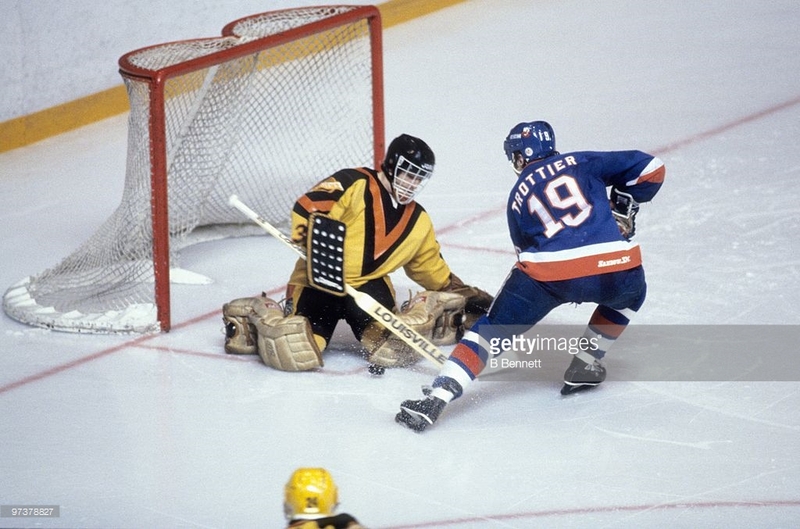 This entry was posted in Qualifying Tournament, Ultimate NHL Playoff and tagged Anders Kallur, Billy Smith, Bryan Trottier, Denis Potvin, Hector Marini, John Tonelli, Mike Bossy, New York Islanders, Qualifying Tournament, Stefan Persson, Ultimate NHL Playoff. Bookmark the permalink.